This is a detailed overview and FAQ of the entire process. 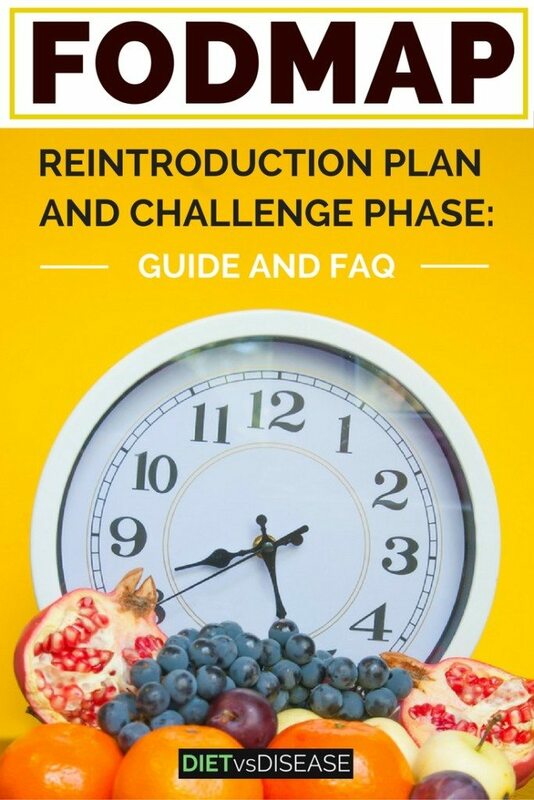 What is the FODMAP Reintroduction Plan or Challenge Phase? Which Foods or Groups Should Be Rechallenged First? What If You ‘Fail’ All Reintroductions? The FODMAP reintroduction plan is the second part of a low FODMAP diet (after the elimination phase), and refers to the strategic process of reintroducing FODMAPs to the diet. This is the only scientifically proven method of treating Irritable Bowel Syndrome (1). It’s also known as the Challenge Phase, Reintroduction Phase, or Challenge Protocol. The terms reintroduce and challenge (or re-challenge) are typically used interchangeably. Following this plan enables you to discover what exact FODMAPs trigger your IBS symptoms. By the end you should have a great understanding of what foods you can and cannot tolerate, and in what quantities. Summary: The FODMAP reintroduction plan is the second phase of a low FODMAP diet. Following this protocol enables you to see what foods you do and do not tolerate. Many people do so well in the elimination phase of the low FODMAP diet that they never want to eat any high FODMAP foods ever again. However, this is a big mistake for many reasons. Many high FODMAP foods are actually really good for gut health. More specifically, the FODMAP groups called fructans and galacto-oligosaccharides (GOS) are known to be prebiotics. Prebiotics are ‘food’ for the healthy bacteria that live in our gut. So essentially, by following a low FODMAP diet long term, you are starving them and killing them off. The low FODMAP diet has been shown to change the balance and numbers of our gut bacteria in as little as 3-4 weeks and science is yet to fully understand exactly what this means for our health in the long term (1). However, we do know that the health of bacteria in our gut, known as our gut microbiota, is linked to many health concerns, such as immunity, mental health and obesity. Therefore, moving through the challenge phase swiftly to identify whether you can tolerate fructans and galacto-oligosaccharides is one of the most important factors to maintain gut health. The restrictive nature of medical exclusion diets increases the risk of not being able to meet your nutritional requirements. This is no different when following the low FODMAP diet. For example, studies have shown that patients following the low FODMAP diet may have reduced intake of fibre, calcium and iron (2). Thus, by completing the challenge phase, you will be able to identify more foods that can be reintroduced into your diet for the long term and improve your overall nutrition. You might be surprised at how many foods you are unnecessarily restricting in the elimination phase. However, this is why the challenge phase is so important. Following the strict low FODMAP diet makes social occasions quite awkward. Arguably, one of the most difficult aspects of the elimination phase is eating out. This is because your diet is so restricted in the beginning. It may even make you feel more anxious about eating out in case you accidently eat something that is high FODMAP. Once you know your food triggers, this can make eating out and social occasions much more stress free and enjoyable. The most important lesson you will learn from the challenge phase of the low FODMAP diet is identifying your own personal triggers. If done correctly, you should know which FODMAP groups you react to, and how much of each group you can have before you start to get symptoms. 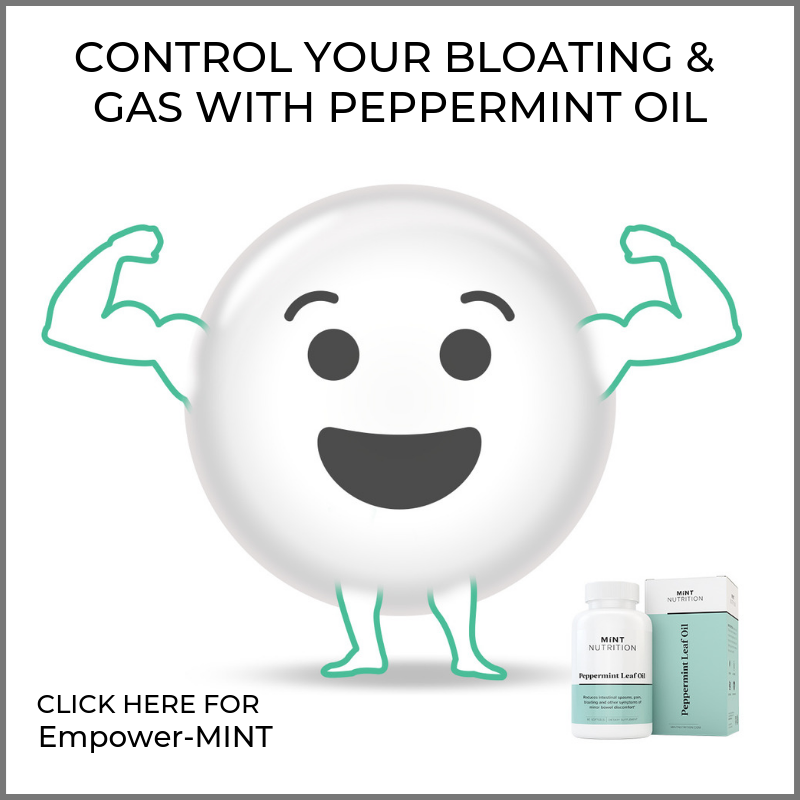 This gives you control over your food intolerance and puts you back into the driver’s seat. The information you learn from this process is then used in the third phase of the diet, known as the modified or adapted phase. Summary: Everyone must rechallenge and reintroduce high FODMAP foods at some stage after the elimination phase. It is not recommended to stay on the low FODMAP diet in the long term for a number of reasons. There are ten FODMAP groups to be rechallenged, one at a time. There are four separate re-challenges for fructans because they occur in a wide variety of fruits, vegetables and grains. Fortunately there’s only one re-challenge for each of the remaining FODMAPs; the exception is polyols, which has two types (sorbitol and mannitol). 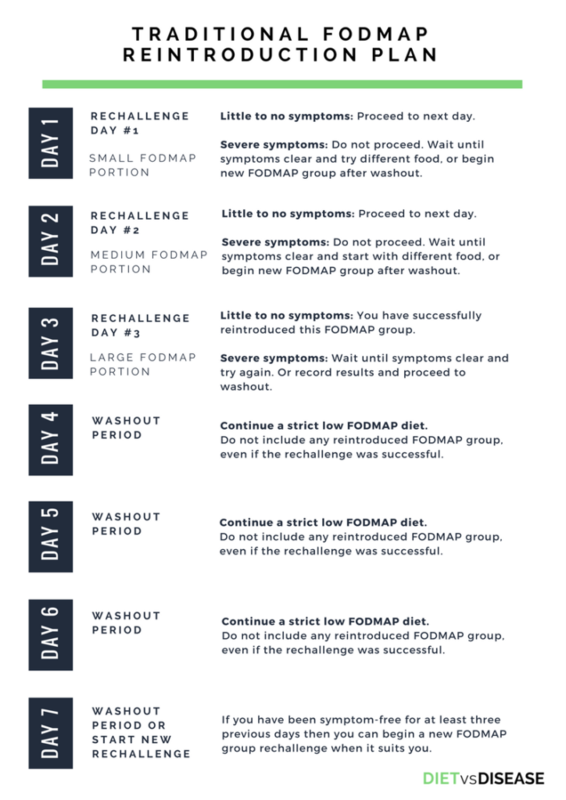 This rechallenging process for each FODMAP group typically occurs over a 3-day period, with 3 washout days in between groups. That is, set days where you completely return to a low FODMAP diet in order to ‘reset’ your digestive system. Want to a large version for download or printing? Or click here to get the plan. So if you are rechallenging for 3 days, and leaving a 3-day washout period, the rechallenge process for one group lasts almost a week. That means ten FODMAP groups will take 9-10 weeks total, assuming no set backs. If you do experience symptoms, you must wait until they settle before testing the next group. Usually the 3-day washout period is enough time, but not always. Note that you should not rechallenge any FODMAPs until you are symptom-free (or as close as you can be). 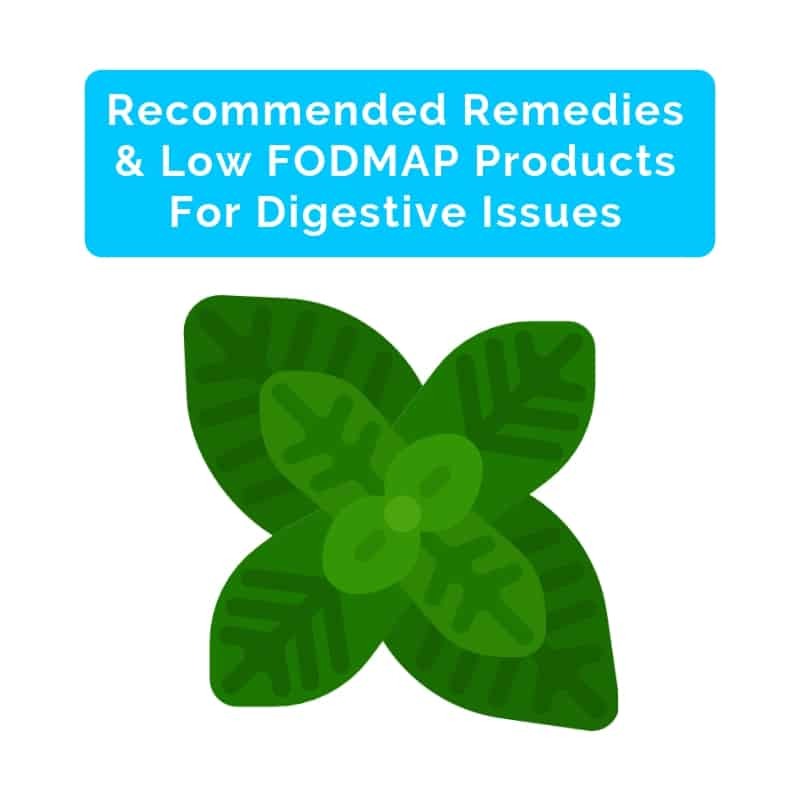 It’s also important during this period that you continue to follow a low FODMAP diet the entire time. Summary: A total of ten different FODMAP groups are reintroduced to the diet, one at a time. Each group is rechallenged over a 3-day period, followed by a 3-day washout period. So it takes at least 9-10 weeks to do all groups. The most appropriate foods for this phase are those that contain only one FODMAP group. This ensures that if you do have a reaction, it’s obvious what FODMAP was the culprit. For rechallenging lactose (following the schedule shown above) you can use full cream or skim cow’s milk. For a detailed food schedule, I invite you to join my FODMAP Reintroduction Quick-Start Program. You can start with whichever group you wish, but it may be easier to start with lactose or fructose as they are quite straight forward. For example you would test onions one week, and then after washout period you would then test garlic. Increase the amount you are testing until you’ve done 3 days. After this, do the 3 washout days and then move onto the next FODMAP challenge. Do not keep the tested food in your diet for the remainder of the reintroduction period (even if it did not cause you symptoms). This simply minimizes potential complications during the process. Try another food from within the same FODMAP group to confirm the results of the first challenge. Or you can assume that FODMAP is a definitely a trigger for you and move onto challenge the next FODMAP group (after waiting for symptoms to resolve of course). This is just an example schedule, and can be too aggressive for many people. Those who are etxra sensitive will need to follow a slower, less intense schedule. Lastly, it’s recommended that you rechallenge any problem FODMAPs again in the future (a year or so), as sensitivity to FODMAPs may change over time. Summary: Rechallenge whichever FODMAP group you prefer first, although it’s recommended to start with a simple one like fructose. Just ensure you only test with foods that contain one type of FODMAP. There are two main options for reintroducing FODMAPs. It should always be done at home where you are in control of the portions and ingredients. Alongside: Prepare the FODMAP containing food alongside your regular meal (that you know does not cause symptoms). For example 1 teaspoon of honey with your dinner. This allows you to easily increase the portion size of the FODMAP you are testing . Mixed: Mix or add the FODMAP food you are testing into your meal or snacks. For example if testing avocado you could add it as part of your favourite dip. This is more realistic to the way you would actually consume that food, but is less straightforward. The best time of day to rechallenge depends on your personal preference and when you would typically eat that food. But I usually recommend doing so in the early evenings when at home. There is no possibility of being ‘caught out’ when at work, and allows enough time to notice symptoms before bed. Summary: Either reintroduce groups alongside or mixed in with the meal. Typically it’s best to test in the early evening when you are home. This varies from person to person and also depends on the severity of the reaction (if there is one). Patients report symptoms anywhere from 4 hours, the next morning or even a full day later. Just like the elimination phase, it’s critical to keep a food and symptom diary during the reintroduction plan. Recording what you ate, what quantity, and what symptoms resulted helps you to identify patterns you might otherwise have overlooked. Want a large version for download or printing? Or click here to get the diary. Note that for some individuals there may be FODMAP groups and foods that will always cause symptoms, regardless of the amount. If you’re highly sensitive to a particular food, you shouldn’t eat it anymore. Summary: Symptoms from reintroducing a group can vary from 30 minutes until several days later. Keeping a food and symptom diary will help you recognise patterns. There are numerous reasons why someone may react to every single re-challenge food, even in small quantities. Testing high amounts of the re-challenge FODMAP: Always start with a small amount first as that may be your threshold. If you don’t experience a strong reaction then in increase it the following day. For example start with ¼ avocado, then progress to ½. Not remaining on a low FODMAP diet: During the entire reintroduction plan you must continue to follow a strict low FODMAP diet, as you were during the elimination phase. After a food has been tested do not add it back into your diet you’ve finished re-challenging the remaining groups. Choosing inappropriate foods: You must re-challenge with foods that contain only one FODMAP. If testing fructose, for example, pear would be a poor choice because it contains both fructose and polyols. Honey or mango only contain fructose and are therefore a good choice. Unintentionally changing your routine: Other changes and stressor can trigger digestive symptoms. Ensure you don’t increase the amount of smoking, alcohol, or caffeine you consume during the reintroduction plan. Stick to your usual eating pattern, and avoid unusually large meals or testing FODMAPs on an empty stomach. Medical conditions or additional intolerances: If you are doing everything correctly, it’s possible you may have additional intolerance issues that should be investigated with your doctor. 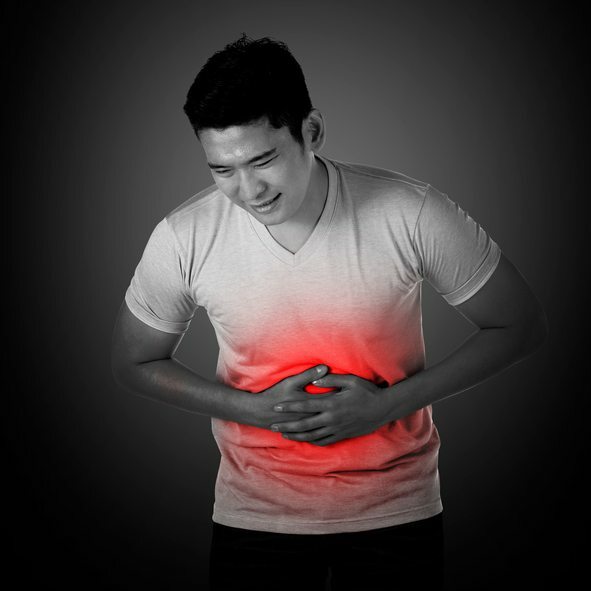 This includes a food chemical intolerance (such as salicylate, amine, glutamate or histamine intolerance), small intestine bacterial overgrowth (SIBO), or even inflammatory bowel disease such as Crohn’s disease. Stress or anxiety: interaction between the gut and brain is powerful enough to induce symptoms even if you are following a strict low FODMAP diet. If you are going through a stressful time, it may be best to hold off on challenges until it passes so that your FODMAP challenge results aren’t confused with the gut-brain axis. If you are feeling anxious about the re-challenge phase, you may also want to consider halving the challenge amounts and doubling the time it takes to do challenges. This would be a more gentle approach and may reduce the severity of symptoms returning if you are sensitive to the group that you are challenging. Unfortunately, while the low FODMAP diet is highly effective, it’s not a cure-all. 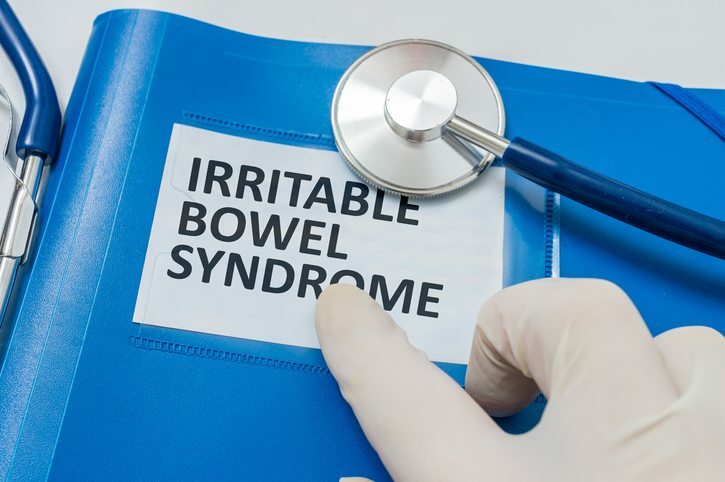 Research shows it doesn’t work well for 1 in 4 patients, although often this is because they were not strict enough during the process, may have alternative food intolerances or medical conditions, or the gut-brain interaction is responsible for symptoms. However, there are some who will not improve despite doing everything correctly. While I’ve touched on the fundamentals, it’s much easier to carry out following a complete FODMAP reintroduction protocol. If a FODMAP-trained dietitian is not accessible, please consider my FODMAP Reintroduction Quick-Start Program. It provides a full protocol to follow and is authored by myself! As always I also strongly recommend investing in the Monash FODMAP app for your phone or tablet. Monash University is the home of FODMAP research, and the app provides the most up-to-date FODMAP food database and recipes available. After you have succesfully completed the FODMAP reintroduction phase, you then move onto a modified low FODMAP diet. 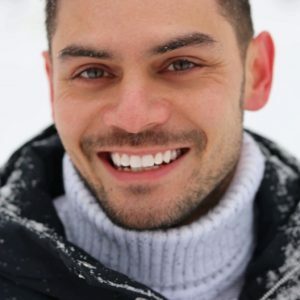 New to FODMAPs and IBS? Start here. Onions and garlic rechallenge, do you try them raw or cooked? Hi Barbara, onions and garlic can be re-challenged, either raw or cooked. Note that they are separate re-challenges, you do have to do both of them but do them separately! Is the fructans challenge for grains and cereals etc one lot of a rechallenge or are they separated by a 3 day break? Hi Raoul, it is separate but you must do both. They are separated by the 3 day break so do one and then the other. Hope that clarifies. I’m in the process of planning out my foods and meals to enter the reintroduction phase in a few weeks. Are there other foods I can eat to test out Sorbitol and mannitol? I don’t eat lychee or shredded coconut, same with mannitol as I can’t stand celery or mushrooms. Also, are the suggested servings sizes of the food being tested to be at each meal, or just total for the day? Thanks…… this webpage has been a blessing as it’s very thorough. My birthday is in two weeks and I’m about to start reintroducing foods, but I know I will probably have a cheat day or two because of my birthday plans (that were made long before starting the low fodmap plan). 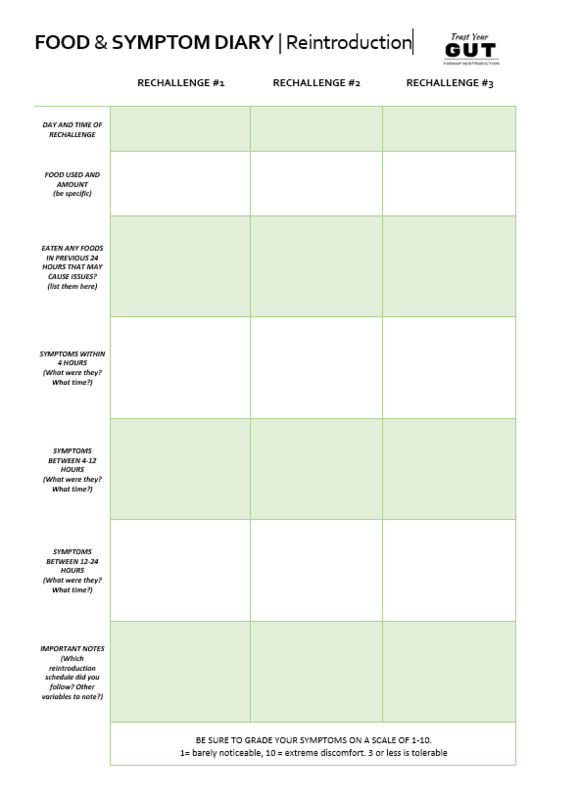 If I have a day or two where I break the FODMAP plan, how long should I go before trying to reintroduce more foods? Hi Olivia, you should wait at least a week and be pretty much symptom free, and then you can resume the reintroduction phase. Great site. What can I substitute for the cornflakes challenge? I am celiac, ie. gluten free, thanks for your assistance.